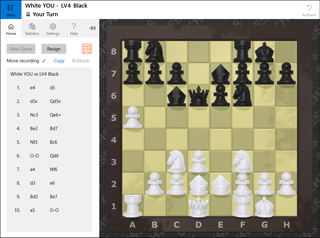 The app's main view displays graphical chess-board & pieces, and some controls ("Menu" button to open sidebar, information about current game and "Rollback" button). In your play-turn, choose a move by touch, mouse or keyboard as follows. Actual actions to choose a move with pointer devices depend on move operation mode ("Slide" or "Tap twice" on Settings tab in sidebar). Tap twice mode : Tap on a piece to take it up and tap destination to put it. Tap twice mode : Click on a piece to take it up and click on destination to put it. Take a piece : Move cursor to the piece by arrow keys and hit space to take it up. Put a piece : Move cursor to the destination and hit space to put it. New game : Configure White/Black players (either player vs computer or player vs player) and click "Start" to begin a new game. Resign : Declare you resign in ongoing game. All the moves players make are recorded in algebraic notation. Statistics lists summaries of total game results (#win, #loss and #draw in each play-level). Select an item to see details of results in that level. Guide marks : Select the type of move guide marks to be displayed on squares. Move operation mode : Select "Slide" or "Tap twice"
Sound effects : Choose "Default" or "None"
Game Help / Terms & Privacy : Open online documentation on this website in default web-browser. Purchase ad-free license* : Open purchase-dialog to buy an annual license. *This feature may not be shown if it's not available in your market.